Quantitative performance testing is a critical check for appropriateness or "goodness of fit"
The stakes for disclosure and external justification are higher. Critics of executive compensation suggest that CEO pay escalates because companies chase an ever-rising market median driven by comparisons to even larger peer companies and higher competitive targets1. Their proposed solution is to place less emphasis on external benchmarking and more on internal wage structures. 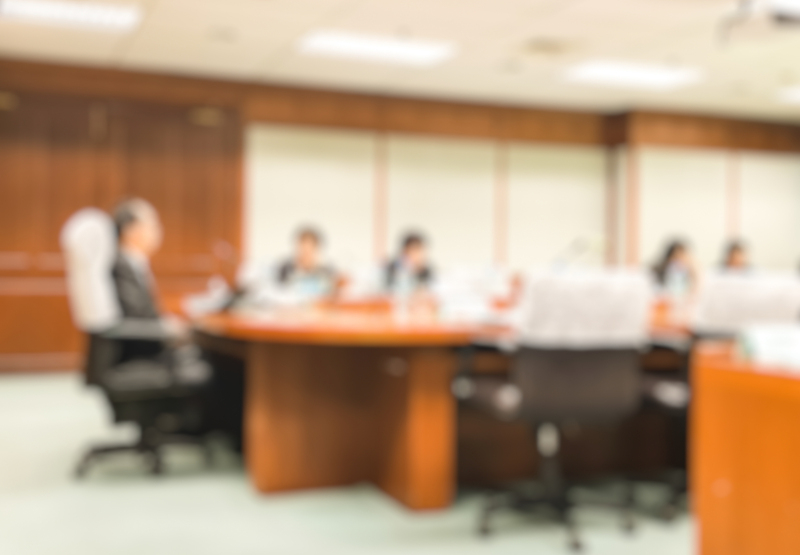 This solution gives little credit to the business judgment of members of public company board compensation committees and is not supported by the facts. 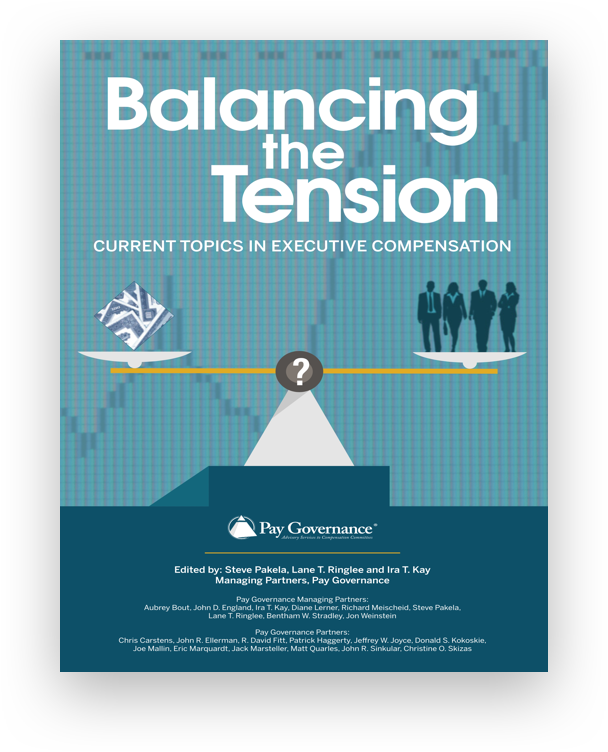 In this article, we present evidence to de-bunk the proposition of the escalation/ratchet-effect of executive pay through blind following of peer group data, and offer some principles and best practices for constructing peer groups and using peer group pay information effectively. In a subsequent, related article, we discuss the use of qualitative criteria in peer selection, the use of multiple peer groups and peer group disclosure. Peer groups, while not perfect, are an important and useful tool, which, can be used to provide decision-quality information, helps decision makers effectively shape executive pay levels and make informed decisions. If true, the presumed ratchet effect on pay from peer group usage results in CEO pay that only goes up. This is not supported by facts, when pay and performance are examined over time. There appears to be an upward ratchet effect until a downward business and stock market trend begins. 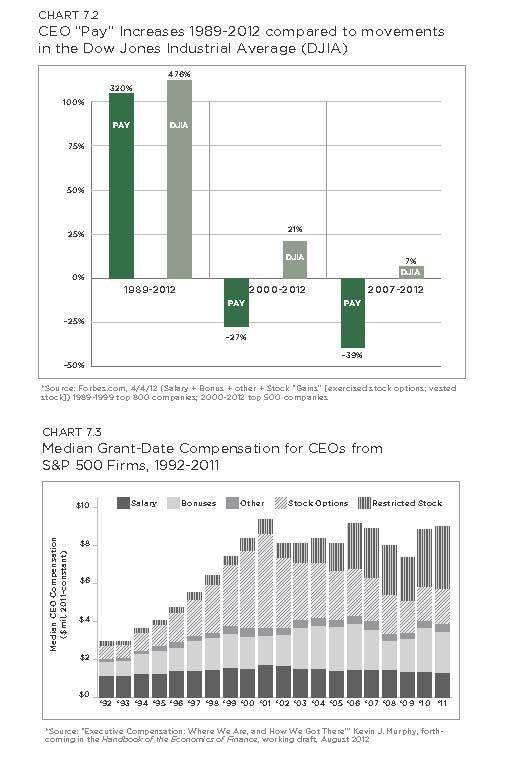 The following charts from Forbes.com demonstrate that CEO pay both rises and falls proportionately with the stock market, specifically the Dow Jones Industrial Average. This is true of pay using two separate definitions, one showing realizable compensation, including the realizable value of stock incentives, and the other showing total compensation opportunity, including the grant date value of stock incentives. The use of peer data in compensation management has become almost a mandate, encouraged by the Securities and Exchange Commission (SEC) and Institutional Shareholder Services (ISS). ISS pay for performance policies, in particular, have expanded the use of peer groups by focusing on the relationship of peer pay data and total shareholder returns. With revised policies in place for 2013, ISS is now taking into consideration a company’s peer group in the constitution of the ISS group used for pay for performance testing, a nod to the prior weakness and narrowness of past policy. While the ISS peer group is frequently different from the company’s, ISS has improved the resulting outcomes. The greater emphasis on using a company’s peers has reinforced the “mandate” to use peers by ISS. As such, we shift our focus to the selection of the peer group as a key component in the pay for performance construct: helping define a competitive pay opportunity for executives and aligning actual pay realized by executives with the relative performance of the company. • The range of available pay plan design alternatives consistent with a company's strategy, operations and value drivers. Though peer group selection is an art, it is necessary for committees to use objective criteria for selection of peers. The strength of a peer group is often in the effective blending of the art with the science, that is, the objective criteria. Descriptive examples of this blending of art and science can be seen in the next paragraph. It is the almost sole reliance on a "one size fits all" set of objective criteria, GICS Code and a rigid size range, that reduce the potential effectiveness of the peer groups chosen by ISS. The screening criteria chosen require judgment and will, in all likelihood, vary based on the types of information sought from the peer group. For example, when using the peer group to help benchmark incentive plan performance standards, the focus may be on competitors for products, services and capital. When using the peer group to understand compensation levels, industry and size standards may be used to define a relevant labor market. Evaluating executive recruiting and turnover information can be very helpful to determining an appropriate peer group. The funnel below shows a representative set of peer group selection criteria. First we select a set of industries broader than a company’s direct competitors to screen potential peers. Within these industries, multiple scope measures function as a second screen. Since we are benchmarking pay opportunity, the majority of which is contingent upon company performance, this example also includes a third set of criteria that ensure our peers share similarities in terms of selected financial characteristics. Finally, we consider a set of qualitative factors to make final adjustments to the peers. For example, adding or removing potential peers to ensure the overall group has an industry balance similar to the host company. 1. Larger companies—for example, the Dow Jones 50— and category leaders compare themselves to other industry leaders, as this aligns with their likely talent markets and reflects the complexity of their organizations. Cisco, Boeing and IBM use such an approach, supplementing direct industry peers with a broader scan of the talent market. The largest companies may also look to the capital markets for alternative options for selecting peers. These peers are companies that capital market investors might include in the same investment portfolio as the host company. 2. 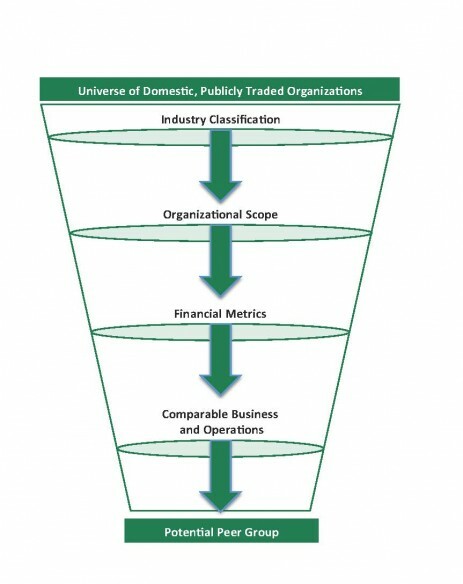 Diversified or “mis-categorized” companies: One key issue is that companies may not necessarily be appropriately categorized in their “true” industry. This may be a result of growth aspirations that may focus on a different industry, or that the company may be more diversified than their industry categorization. These situations require a broader review of industry segments and a qualitative review of the companies that meet the initial screens. More likely than not, this will require the use of multiple industry categories. • Early-stage, high growth or recent IPOs: Market capitalization may be the best indicator of size and scale, but balanced with current measures of growth performance such as revenue. Most importantly, the selection of size parameters must take into consideration the specific circumstances of the company and its situation. For category leaders, the size scan may be used to establish a threshold minimum given the limited number of potential peers that are above that size limit. • Biased market data: Summary statistics on compensation may be swayed by one or two outliers that represent the extremes in size or performance in a peer sample—that “ratchet” issue we discussed earlier that is the focus of executive pay critics. Groups can also be above this standard for valid reasons. The most common rationale for a deeper peer group is the need to have broad, consistent data to either offset the impact of significant M&A activity, or the desire to use a consistent peer group for benchmarking pay for positions below the top 5 highest paid. Also, if the company is a category leader, then it is likely comparing itself to other category leaders, rather than an industry segment, and a more robust data set provides a sound assessment of general industry practices for this talent market. Boeing and IBM are examples, where peers from outside their industry increase the peer group up to 24-28 peers. For those with limited competitors of like size, where market share is concentrated among a few larger firms, a supplemental group of general industry companies of similar stature, size and complexity may be used (as is the case with Cisco). A peer group is a key component in compensation design, but it is not the foundation or bedrock of a compensation philosophy—it is a source of decision quality information and a potential shaper, influencer and leveler. Composition of the peer group is important if the information it generates is to be reliable and useful. The goal is to develop a peer group that supports your strategy and is a critical link to the market for talent—supply and demand—and pay for performance. The criteria for peer selection should be objective and easy to communicate to shareholders and to key staff. However, we recommend further qualitative assessment to ensure the peer group is representative of the performance of your business and that it exhibits similar cyclicality. 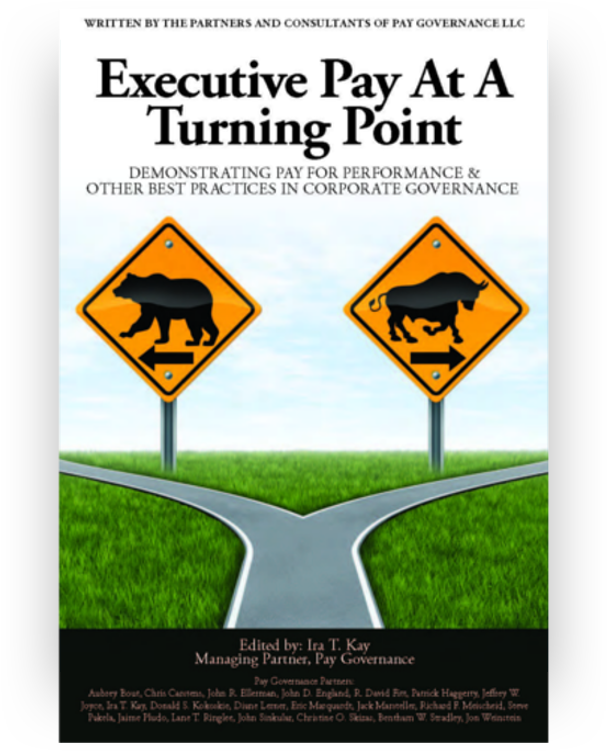 (See forthcoming ViewPoint on Executive Compensation: Putting It All Together). 1.”Executive Superstars, Peer Groups and Overcompensation”, Charles M. Elson and Craig K. Ferrere, University of Delaware, October 2012. 2. Morgan Stanley Capital International (MSCI) and Standard & Poor’s. 3. “Why Has CEO Pay Increased So Much?”, Xavier Gabaix and Augustin Landier, The Quarterly Journal of Economics, February 2008. 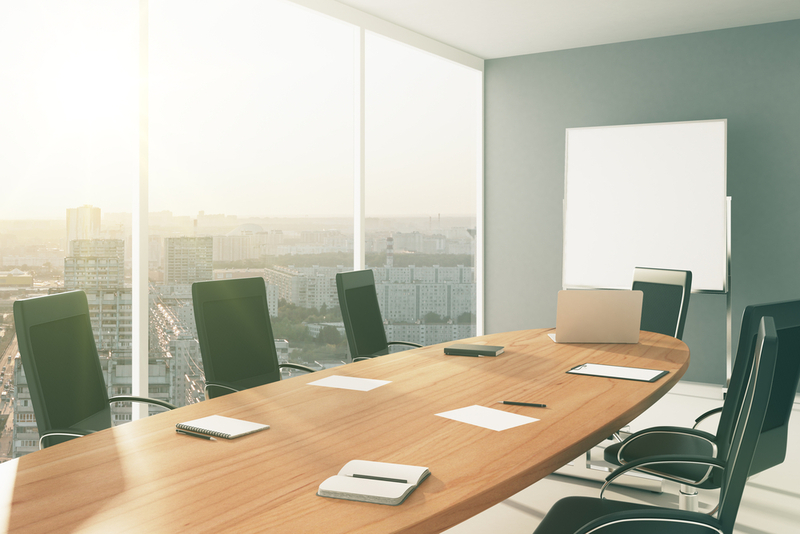 Click here to see a video featuring Ira Kay speaking at a recent Conference Board Director Roundtable: Executive Compensation and the Utility of Peer Groups.